A year ago I at last had the opportunity to make my dream of traveling to the Himalayas a reality. Ever since my first hike in the Drakensberg I’ve had a fascination with Everest and the Himalayas. 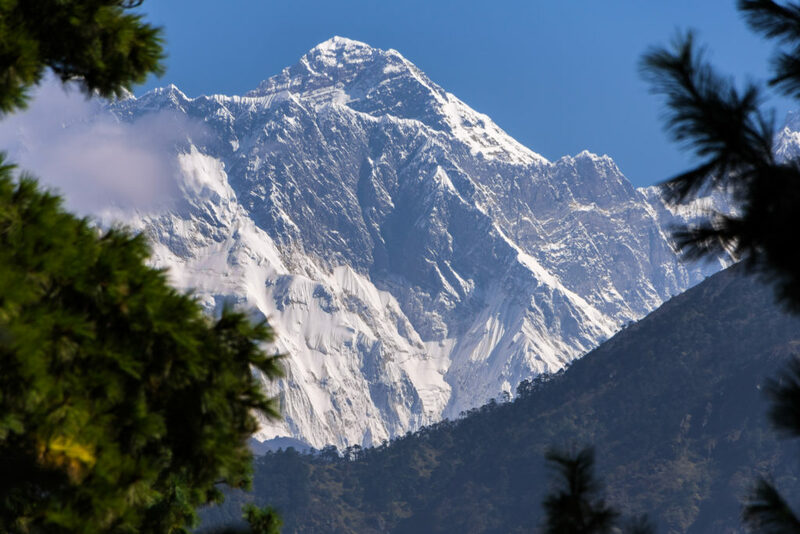 I always dreamed of following in the footsteps of Hillary, Tenzing-Norgay, Messner, Breashears, Viesturs and countless other mountaineers and trekkers to Everest Base Camp. With the booking made through Nomadic Adventures, I didn’t give much more attention to it until I suddenly realised that only a month was left before I had to board the plane to Kathmandu. I still had a lot of preparation to do for the three week and 140 odd kilometer trek. Supplementing my existing hiking gear, obtaining prescribed medication like broad spectrum antibiotics and all the small stuff you don’t normally think about. Stuff like wet wipes, lip balm, toilet paper, sun screen and inner socks. These little items can make or break your experience in the mountains. The biggest factor to consider was weight. I was only allowed fifteen kilograms of luggage for the flight from Kathmandu to Lukla. Now consider what needs to go with… hiking clothing for temperatures well below freezing point, a -15 sleeping bag, medication, powdered energy drinks and snacks, photography gear, tripod and then some more. This was a massive headache and stress. With preparations done my journey commenced on Friday the 13th of October. It started with a six hour drive from White River, Mpumalanga to OR Tambo International, Johannesburg via Pretoria. My fiancée saw me off at the airport with an emotional farewell. I miraculously then bumped into a good friend I hadn’t seen in nearly a decade…on the same flight as I to Dubai with Emirates! Sunrise was over the coast of Somalia. After a toasty four hour stopover in Dubai I was at last on my way to Kathmandu. Having booked a left seat at check-in in Joburg I was treated to some spectacular scenery. First up was the mightily impressive 828m tall Burj Khalifa building. We then crossed the emerald blue Gulf of Oman with dozens of ships drifting in the calm sea. The Central Bruhui mountain range in Pakistan with their knife-edge ridges looked like a godforsaken hell hole. Snaking rivers and endless human settlements sprawled the green landscape in India. Finally just before sunset the Himalayas peeked through wispy-clouds on the horizon. A massive thunderstorm cell, west of Kathmandu, delayed our descent by at least twenty minutes as we touched down just after dusk. I obtained my tourist visa and cleared customs. Nothing in life has prepared me for the hour drive from the airport to the hotel in the Kathmandu tourist suburb of Thamel. Humanity, canines, motorbikes, scooters, rikshaws and buses perform a rhythmic, urgent and death-defying dance between one another. No robots or stop streets are present…only the odd roundabout which sometimes causes complete gridlock. When traffic comes to a standstill it usually requires one scooter rider to unlock the puzzle and get everything moving again. Dust form the roads fill my lungs. This city is a pulsating beast. All the shops are open until at least 8pm. A western view of Kathmandu from our hotel roof. With frail nerves I arrive at the hotel. The Thamel Eco Resort is a neat, friendly hide-away from the frenetic streets of Kathmandu. A warm soup and coffee for US$3 soothes my hungry tummy. The rest of the group is delayed in the Seychelles and will only arrive the next day. After 36 hours on the go I’m grateful for a hot shower and flat bed. The next day shopping is on the agenda. I need a down jacket and sleeping bag and buy both items for the ridiculously low sum of US$100. Every third shop in the streets of Thamel is an outdoor or trekking outlet. If I had known this I would have made all my purchases in Kathmandu and saved in the process a whole wad of cash. There is more I’d like to buy but I can take only so little to the mountains and hence I spend a lot of the day just browsing. The other guys finally arrive later in the afternoon. We have our last beer before the trek on a sunny rooftop overlooking the city. It’s extremely important to stay properly hydrated during altitude acclimatization. We thoroughly savour the moment as we won’t touch alcohol again for the next two weeks. After dinner we have to weigh our duffel bags and daypacks. I come in at 16kg and somehow have to shed a WHOLE kilogram! Some of my powdered energy drinks, almost all of my snack bars and the medicine’s packaging don’t make the cut. With that being said, the next morning I still need to wear in the stifling heat my wind proof jacket and gaitors with full hiking gear. Every pocket on me is crammed with necessities which would otherwise make my bag over weight. Apparently personal weight makes no difference to aircraft loading sheets…as long as the bags weigh less than 15kg she WILL fly. At 8am we arrive at Kathmandu airport and it’s chaos. 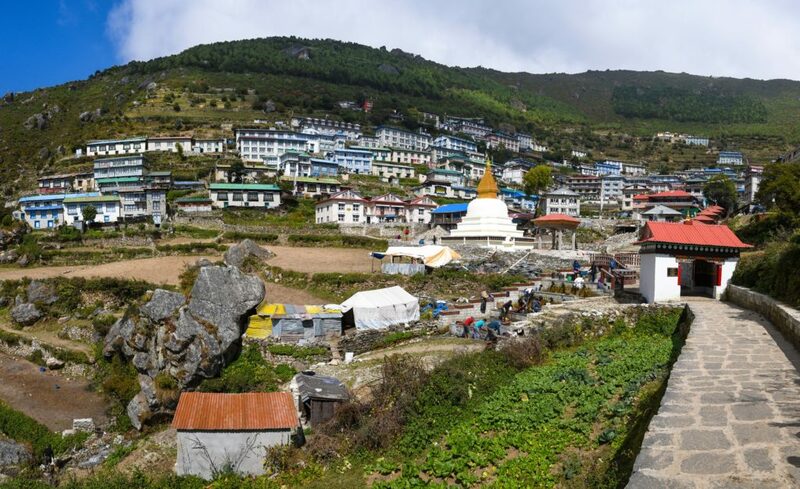 The flights to Lukla are backlogged for hours due to bad weather and maintenance on the runway. We patiently wait seven hours long in the overcrowded, stuffy, noisy and claustrophobic departure hall. At 3pm our flight with Tara Air is called. Hastily we scramble through the boarding gate, onto the bus and we board the twelve seat Twin Otter plane. As there are no seat placements it’s a bun fight for the left hand seats to get a better view of the mountains. We’re strapped in and the pilots go through their checklists. The solitary air hostess boards and without a hint of sympathy announce, “Unfortunately the flight is cancelled. Bad weather at Lukla. Will you please disembark” We all stare at her in disbelief, waiting for her to follow with, “Only joking!” No place for humour on this flight. She tells us again to disembark and with a collective groan we unbuckle and leave the aircraft. We’ve effectively lost a day if we can’t make it to Lukla that evening. There are no guarantees that we will get a flight the next day. Regional flights in Nepal, cancelled due to bad weather, does not automatically place you next in line when flights resume…you fall in at the back of the queue. Plan B suddenly swings into action. We try to organise a helicopter but it’s already late in the afternoon and there aren’t pilots available. Somehow we manage to find an operator who has waited the whole day just for this moment…seven eager clients, willing to pay the premium. After a lot of bargaining we each have to pay an additional US$200. The operator agrees to try and collect our forfeited $150 from Tara Air for the flight to Lukla. The price is steep but there’s not much of a choice and we get checked in again. They drive us to the other side of the airport. For this flight we HAVE to climb on the scale. Obviously helicopters don’t like to be overweight in the higher altitudes. We wait for an available pilot as time ticks away at my nerves and the sun relentlessly moves to the horizon. I’m starting to resign myself to the fact that we’ll have to return to our hotel in Kathmandu for the night. The thought is too much to bear. Suddenly we get summoned to the Eurocopter B3 Squirrel standing on the ramp. There’s only space for the six of us, which means Wayne and our lead guide Nga-wang has to stay behind. The pilot jumps into his seat. By the look of it he’s had a long and hard day. He tries to get flight clearance to Lukla from the control tower. It’s a “Negative”. We all look at each other. “Not again!” He tries for Ramechhap and gets the clearance. We’re in luck. 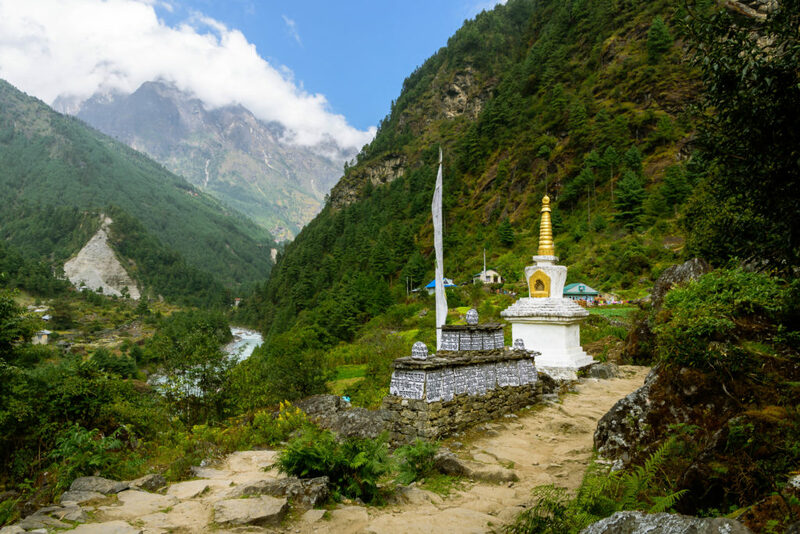 Ramecchap is a little village with a tarred runway half way between Kathmandu and Lukla, next to the mighty Tamakoshi River. We were not going to sleep in Lukla that night but at least we would be out of Kathmandu and finally in the Himalayas. The outskirts of Kathmandu in hazy conditions. And so one of the most memorable flights (only slightly less so than the following day’s flight) I can recall started. 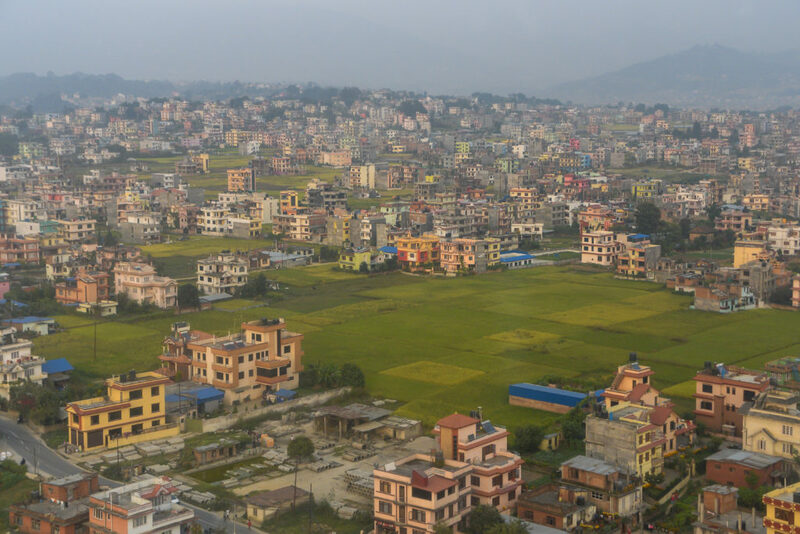 Climbing out over the outskirts of Kathmandu we made our way into the Trisulu River valley. Due to a weather inversion visibility was extremely poor due to haze. 2000 feet high mountains rise up from the river down below. These are supposedly only the Himalayan foothills and I’m already blown away by their sheer scale and steepness. Villages lay scattered all over the slopes. The pilot keeps our altitude at 4500 feet above sea level, skimming over a ridge every now and then. 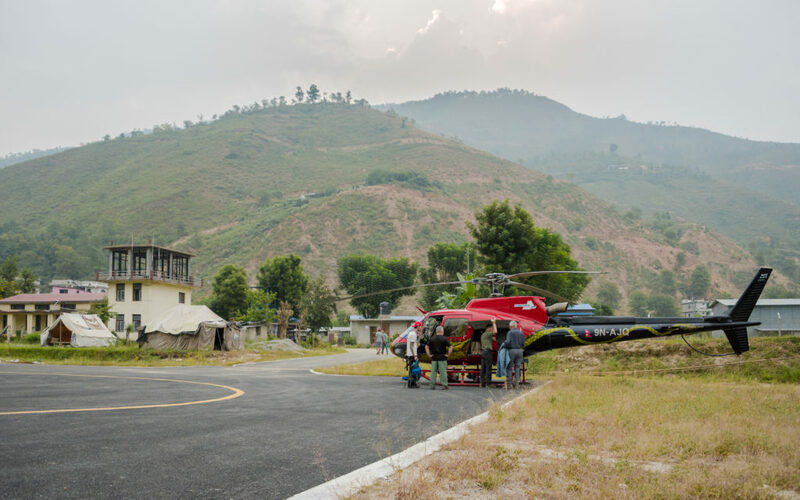 Making our way back to the helicopter through the village of Ramechhap. Twenty five minutes later we landed well after sunset at Ramechhap (2000ft asl.) We were now 2400ft LOWER than Kathmandu! Certainly not helpful for acclimatisation. After securing the helicopter for the night we had to find a place to sleep. The pilot, Eric Ridington, is Canadian. He had been working in Nepal on contract for a while and knew one of the pilots from the Discovery reality show, EVEREST RESCUE. As it was already dark he would join us for the night and fly us out the next morning to Lukla. After a ten minute hike we found a decent lodge and checked in. This stay was excluded from our itinerary. A room with air conditioner and a very hard bed set me back 910 Nepalees rupees, or US$9. With mozzies zooming all around I thought it was very reasonable. Pre-flight for our flight to Lukla from Ramechhap. The next morning we left at six sharp. The bonus was we had another twenty minute helicopter flight. We were slowly making our way out of the haze as we gained altitude towards Lukla at 9000 feet above sea level. The B3’s climb performance impressed me. Seven up with luggage and it made no complaints to climb 500-1000ft per minute. A few times we would fly towards a ridge where it looked like we might not make it over, only to then skim a few feet over the edge. I had the headphones on and Eric pointed out some landmarks. THEN….snow covered peaks appearing through the clouds and haze, towering 12000 feet above us! A moment I’ll never forget. The sheer scale and height of the Himalayan peaks was mind blowing. Approaching Lukla runway on short finals. It’s steep and SHORT. 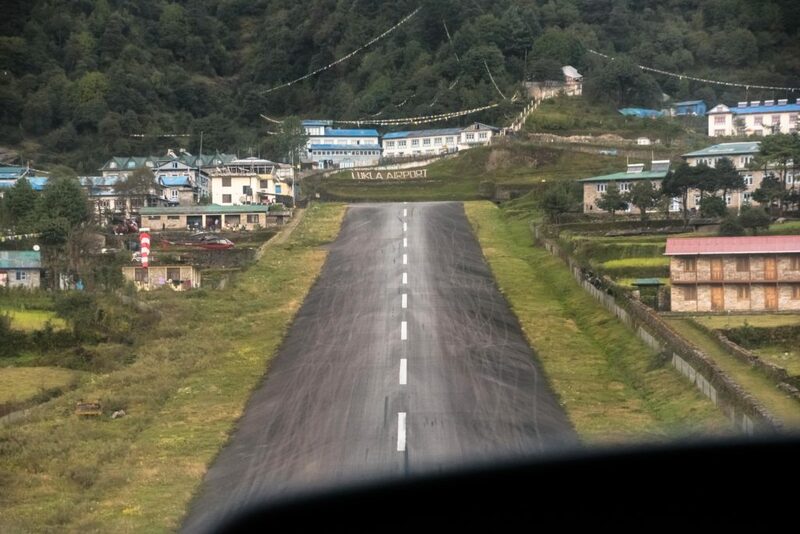 We made the approach to Lukla runway but off course much slower and safer than with a fixed wing aircraft. It was still early morning and the temperature drop from Ramechhap to Lukla must have been at least 15°C. 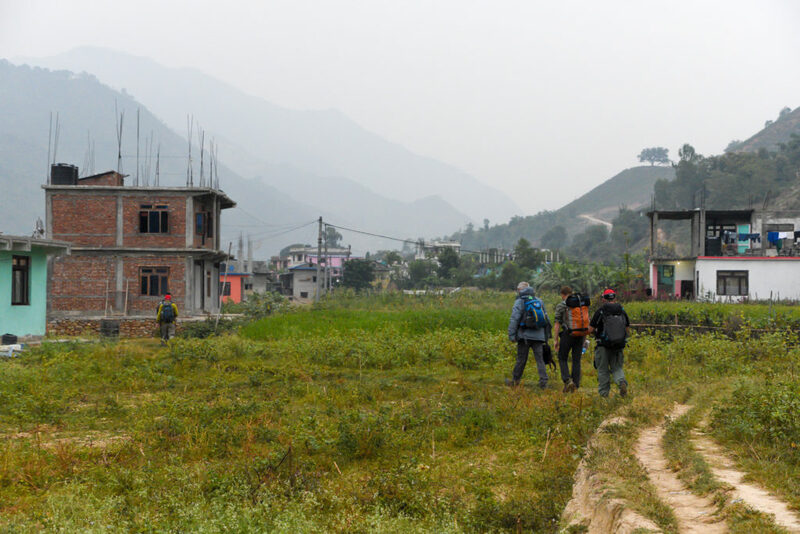 We met up with our guide and set off to the Himalaya Lodge situated close to the runway. What to do though as our lead guide and tour leader was still in Kathmandu. We discussed this scenario at length the previous evening. As we had lost half a day we decided to trek a bit longer on the first day. 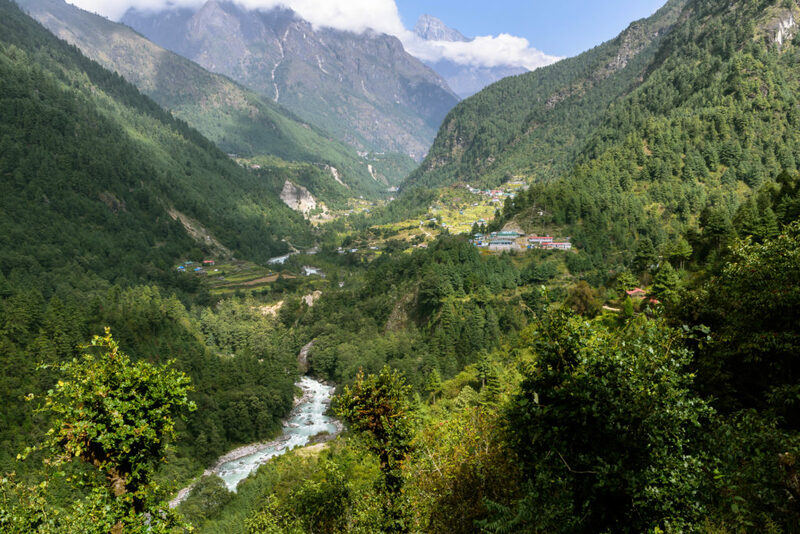 Instead of the six km to Phakding we would hike thirteen km to Monjo, which is a bit closer to Namche Bazaar’s steep and long pass the next day. After tea and breakfast we set off just after 9am. Kusum Khankaru West Summit (5579m) seen from Lukla. The first section to Phakding is a descent of 600 vertical feet. It was great to finally start the trek as it had taken four days of traveling and waiting to get to this point. The scenery in the valley was breath taking. 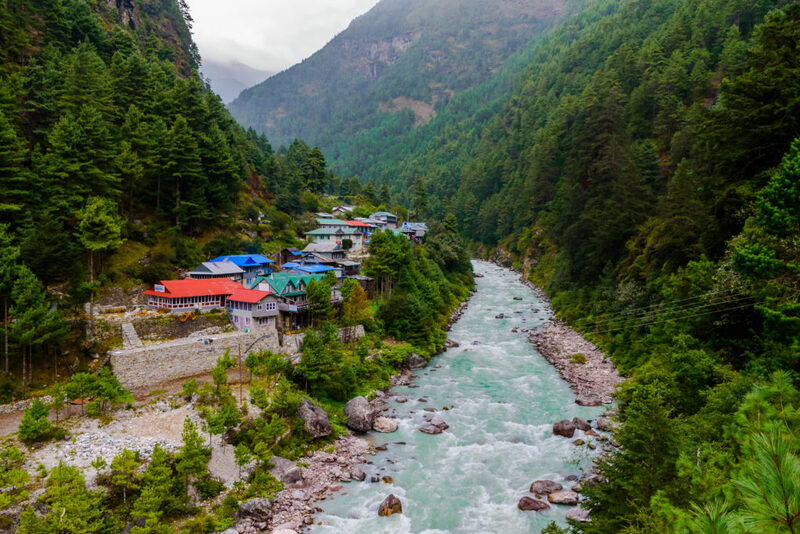 The aqua coloured Dudh Koshi River (Milky River), with its source at Everest, was flanked by 2000 feet steep mountains on either side. Alpine forests covered the slopes. Rhododendron season is in spring and we therefore didn’t see much of it. We made our first acquaintance with a yak train and got into the rhythm of hiking. It took a few kilometres to sort out my daypack and camera bag so they would sit comfortably over my shoulders. I felt good and tried to savour every moment. Phakding. Crossing over to the western side of the river. One of dozens of Stupas along the trek. 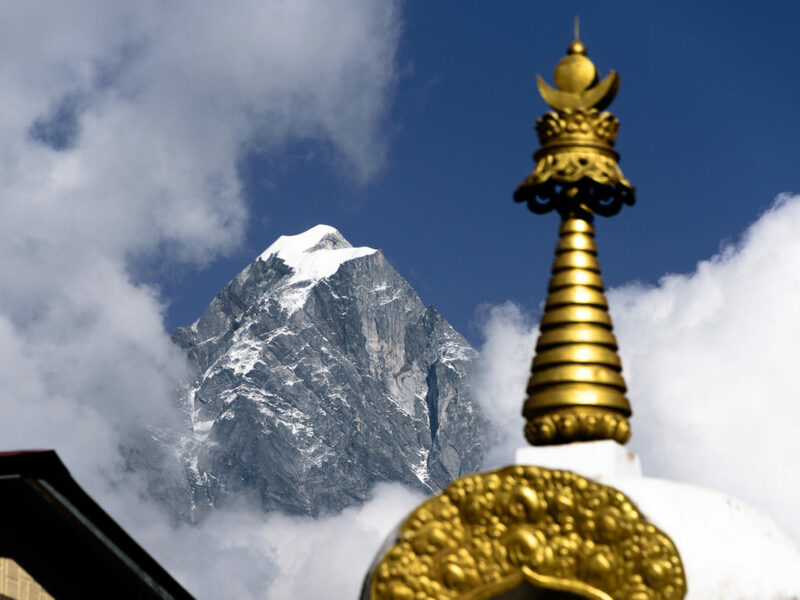 A stupa is a Buddhist shrine. Always pass on the left. 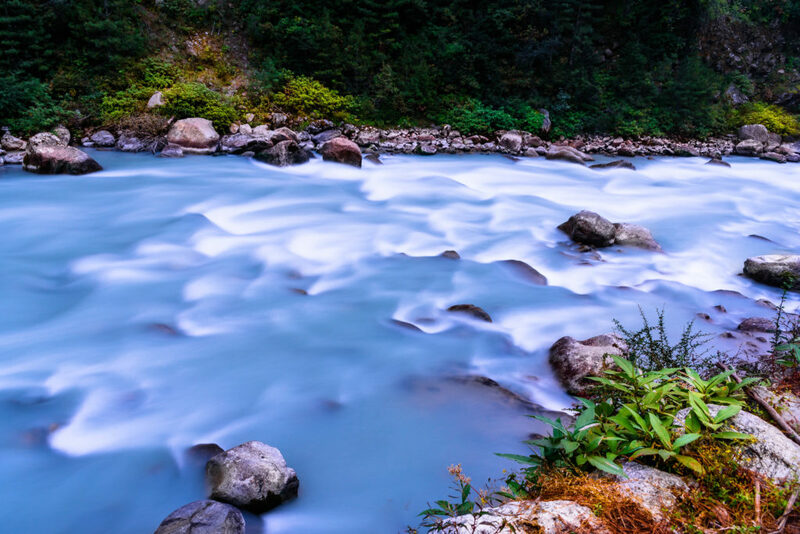 The spectacular Dudh Koshi River close to Monjo. The entrance to the Sagarmatha National Park. After tea at Phakding we started the climb towards Monjo. We crossed the first of several suspension bridges. You hike through lots of little villages and they all offer accommodation, ablution facilities and curio shops. Finally we made it to the entry point for the Sagarmatha National Park. A short hop down the hill from here is Jorsalle where we slept the first night. The lodge sits on the river bank. The rushing water outside our bedroom window made it sound as if we were next to the sea. The village of Jorsalle. We slept in the nearest lodge with the green roof. Before the trip I had the best intention of showering every day. At Jorsalle I had the first of only two showers the entire trip! The outside shower’s water was warm for maybe thirty seconds before the gas ran out. To have cold showers at night while over 9000 feet is no fun. You also pay to shower and like water it becomes more expensive the higher you climb. I made peace with the fact of washing with wet wipes. 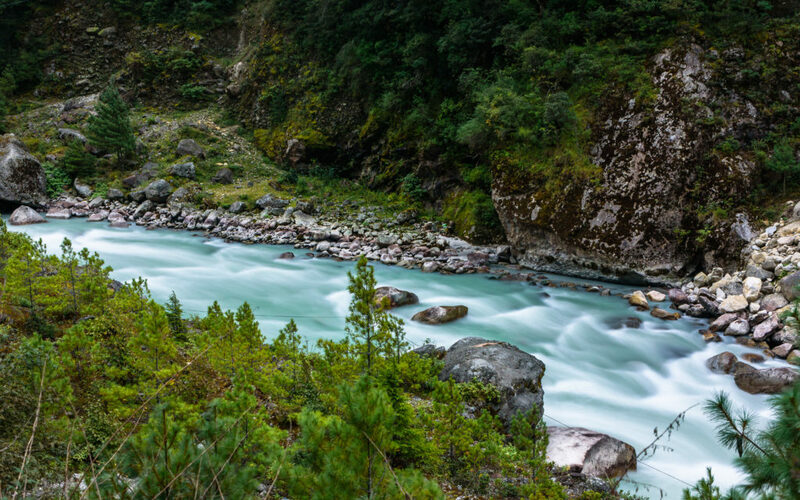 The aqua colour of the Dudh Koshi is due to glacial ice that has melted and rock sediment. @ Jorsalle. 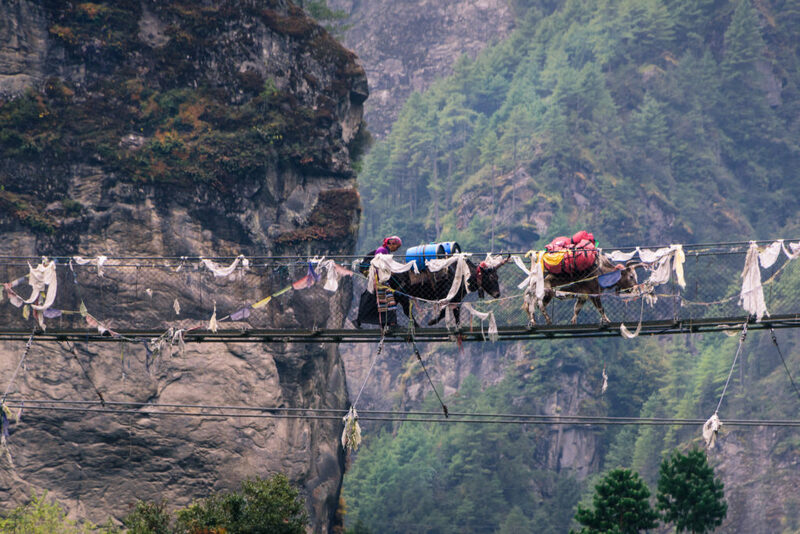 Yaks, donkeys and porters carry all goods into the Himalayas. Wayne and Nga-wang finally caught up with us at 8pm after only landing at Lukla in the late afternoon. The same distance we had covered in eight hours they completed in four. Half of the group’s bags though were still in Lukla. It didn’t make it on the first helicopter flight and there were no space for it on the Lukla flight that Wayne came in on. The three irate members would have to wait another day before they could reunite with their bags and put on some clean and warm clothes. 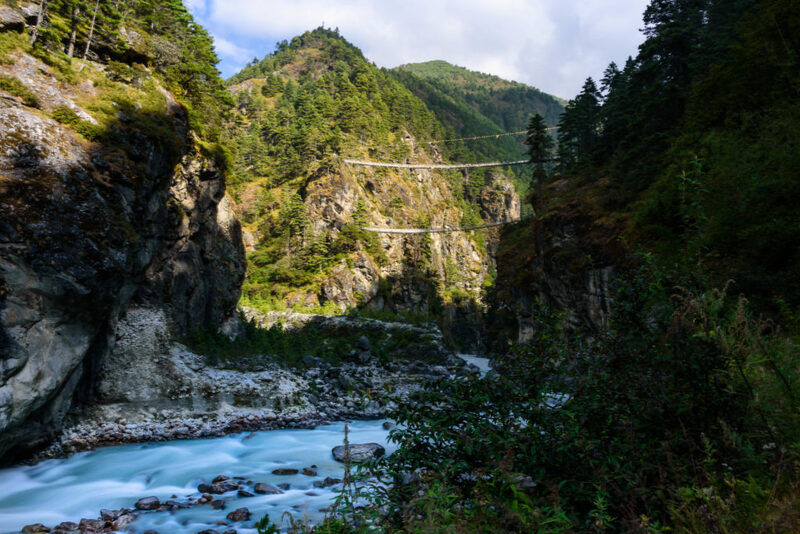 The most famous suspension bridge on the trek…Larja Bridge. 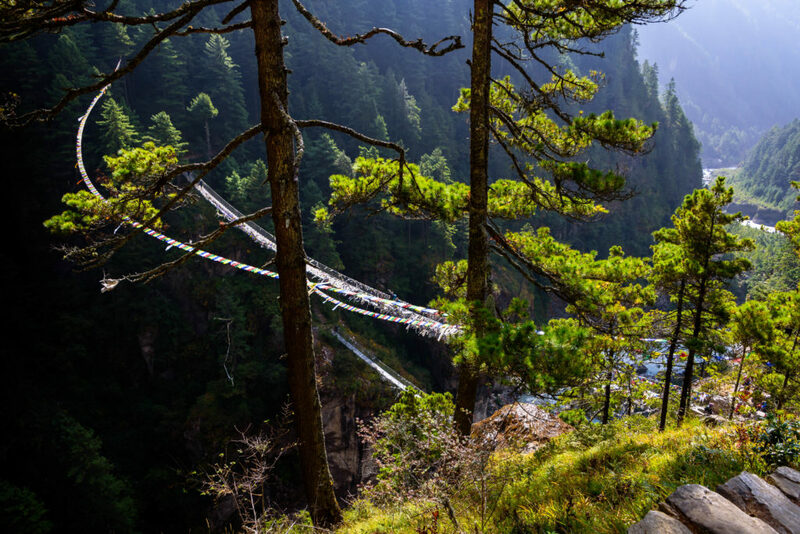 The next morning it was upwards and onwards for the three kilometre hop to Namche Bazaar. This is one of the biggest climbs of the trek…gaining altitude of 700 meters. The climb took us three hours. Not long after leaving Jorsalle we got to the famous and very high Larja suspension bridge. Crossing it takes a bit of nerve but the bridge is very stable. It’s not a big deal at all if you keep your eyes just straight ahead instead of looking down. It tends to create a bottleneck when yak trains also use it. 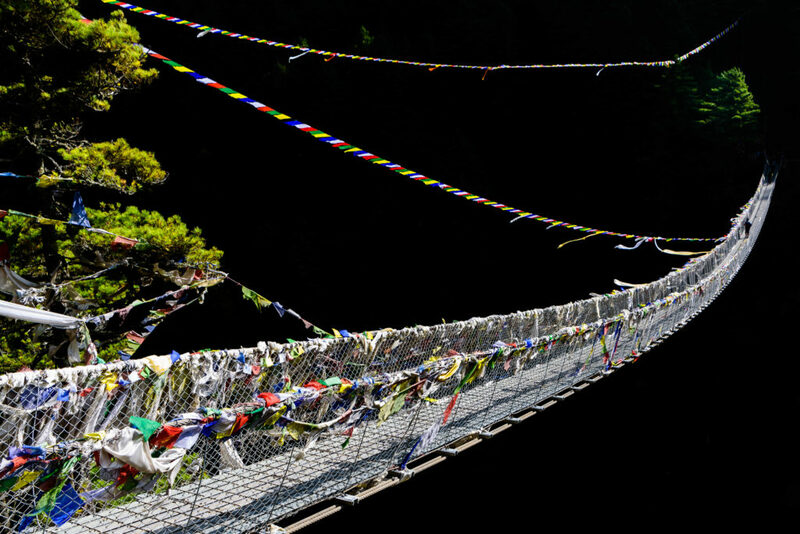 Trekkers prefer one-way traffic instead of having to cross each other on the bridge. Looking back down to Larja Bridge. Seeing Mt. Everest for the first time. Still at least 20km away as the crow flies. 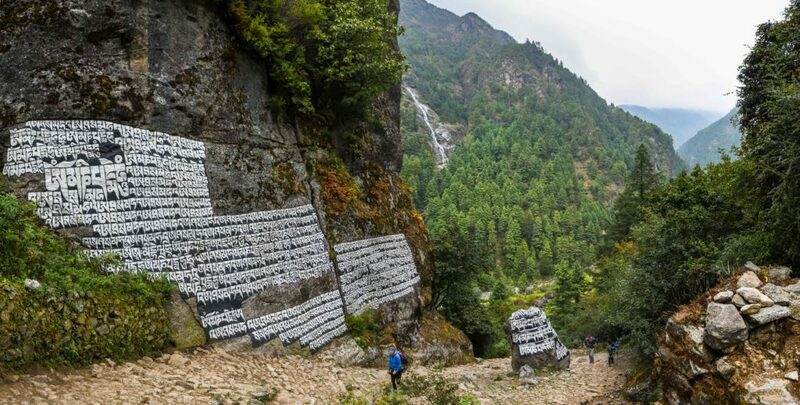 The massive Nuptse wall is in front. After the bridge the climb starts in all earnestness and it’s just a slog up to Namche Bazaar. Suddenly you start to feel the effect of altitude as the pass tops out at 11150ft. Early on in the pass you see Mount Everest in the distance for the first time. It is a truly magnificent sight. Ariving at Namche Bazaar (3440m). Locals doing their washing in the canal. And so after leaving South Africa five days earlier I finally felt like I was in the Himalayas. There will be much more about Namche Bazaar in the next blog.